Actually members of the rhododendron family, native azaleas differ from the popular hybrid varieties primarily in their habitat, preferring more shade than sun. In the wild, native azaleas are more likely to be found growing as a forest understory shrub, standing out from the background only during its blooming period. Relying on the plant’s leaves for identification can be tricky, as they are often quite similar from species to species. But through careful observation of the leaf as well as other of the plant’s major characteristics, most plant scouts should be able to identify several species of native azalea. United States is home to 16 distinct species of native azalea, though numerous hybrids between native species exist. Bloom time can vary drastically, with some species coming into flower before their leaves unfurl in the spring, while others bloom after leaves have emerged, from spring into midsummer. Native azaleas are generally classified by bloom color: white, pink and red-orange. Fifteen of the native azalea species are found on the East Coast; the lone standout, Rhododendron occidentale, is a resident of the western states. Most species grow to between 8 and 15 feet in height. Determining when the specimen in question blooms, as well as the number of petals, color and number of stamens, and texture of flower can quickly narrow down the list of potential candidates, though overall color is the primary identifier. White-flowered species are the Alabama (R. alabamense), sweet (R. arborescens), coastal (R. atlanticum), swamp (R. viscosum) and May white (R. eastmanii) azaleas, as well as the lone West Coast native azalea (R. occidentale). Pink-flowered species are the Piedmont (R. canescens), mountain (R. canadense), pinxterbloom (R. periclymenoides), roseshell (R. prinophyllum) and pinkshell (R. vaseyi) azaleas. Red and orange-flowered species consist of the Florida (R. austrinum), flame (R. calendulaceum), Cumberland (R. bakeri), Oconee (R. flammeum) and plum-leaf (R. prunifolium) azaleas. A relative majority of native azaleas have leaves that are described botanically as being glabrous, or smooth. Leaves are generally 1 to 2 inches in length, oblong in shape and pointed at the tip. Leaf margins are smooth and unbroken by serrations or dentations. Roseshell azalea (R. prinophyllum) differs slightly in that the undersides of its leaves are pubescent, or covered in short, soft hairs. The plum-leaf azalea (R. prunifolium) differs from other species of azalea in that its leaves have short, bristly hairs along the leaf veins, as opposed to being entirely smooth. 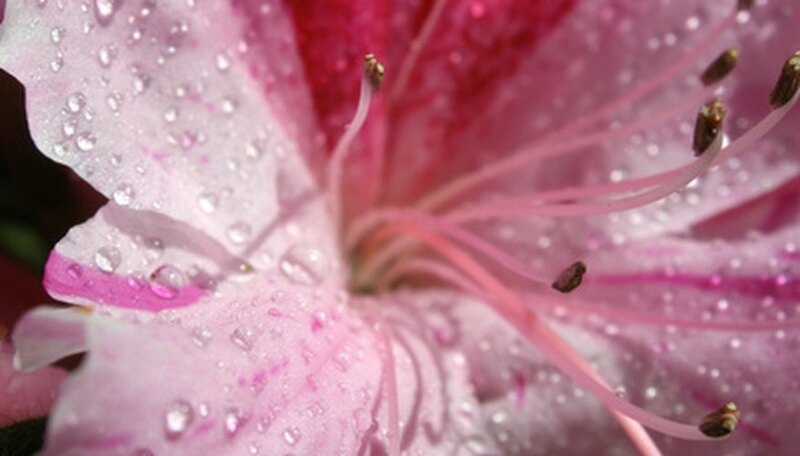 The western azalea also differs, having short, fine hairs along its leaf margins. Several species grow as dwarf or compact species, notably the pinxterbloom and Cumberland azaleas. Coastal azalea is one of several species with a stoloniferous growth habit, where the plant spreads to cover large areas of land via underground stolons, or runners. New plants, which are actually clones of the original plant, spring up along the stolons, giving the impression of a large mass of the same plant. Most other types of azaleas grow as individual, multi-stemmed shrubs. The vast majority of native azalea species can be found growing in mountain forests, forest bogs, swamps and along streams in the hills of the East Coast from Newfoundland to Georgia. Several other species occur in a more limited range in the lowland swamps and bogs of Alabama, Georgia and Florida. Some, such as the Oconee azalea are vanishing rapidly due to extensive development throughout their limited native range. Species that are concentrated in the North Carolina and Virginia stretches of the Appalachian Mountains include the Piedmont, pinxterbloom and swamp azaleas.